I started 2012 with a trip to Las Vegas and ended with a trip to Fort Myers Florida. In between I traveled over 82,000 miles to 36 different cities over 126 days. That’s about one-third of the year on the road and 86% of it was business travel. That’s not to say that I didn’t have a chance to see the sights in London and Paris, but they were primarily business trips. In the state race, I picked up 3 more US states that I have never been to. This brings my total to 43. It has been six years since I have gotten a new state, and this year I got three new ones. I also called this the year of the view from the top of things. I went to the top of four man-made structures and looked out over the city. Each one provided a new view for me, as I had never been on top of any of them before. And I’m getting ready for travel in 2013 with a few trips planned for this month, including one to another new state. Watch this space for more. I’ve had a busy travel year, between speaking engagements, conference attendance and a new job. I traveled to many parts of North Carolina, 9 different states, including California 3 times, Texas 3 times, New York, Pennsylvania, Massachusetts, Arizona, Connecticut, Florida and Wisconsin, as well as Washington DC. I also visited 3 different cities in 2 Canadian provinces. Below are some photo highlights. There seems to be a preponderance of water and lighthouses. Tonight we ate at Uchiko, a Japanese Farmhouse Dining restaurant. It is the alternate version of Uchi, which is a more traditional Japanese sushi restaurant. Kipp and I went without a reservation, and were seated immediately at the sushi bar. This meant that during our meal, we interacted with one of the sushi chefs who prepared some of our food. Here is my tweet from after we finished. Photos and descriptions of the food follow. Last year while at the South By Southwest Interactive (SXSW) Festival in Austin Kipp Bodnar, Dave Thomas and I had dinner at Uchi. It was an amazing meal, and Kipp and I are definitely going back this year. I had an annotated menu that listed what we ate, and I figured this was the best way to make sure we had the list when we went back. The meal was made up of a series of small plates, and we each selected a number of plates. Our server determined the order of the food, which really made the meal spectacular. Normally the kids and I take our summer vacation and go to the beach. Since the coast of North Carolina is only a couple hours away, this is a convenient place to spend a week as the summer winds down. 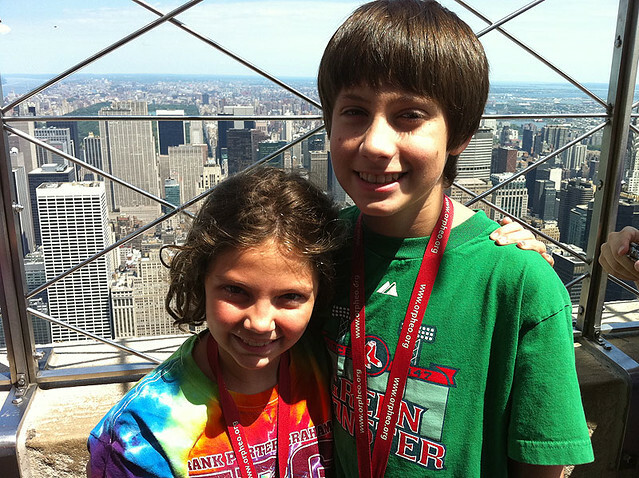 This year, they asked to go to New York City instead. We had been there a few years ago, but only for about two days. As my son said, We didn’t get to do much and there’s so much to do. After some convincing, I agreed and we booked our trip. 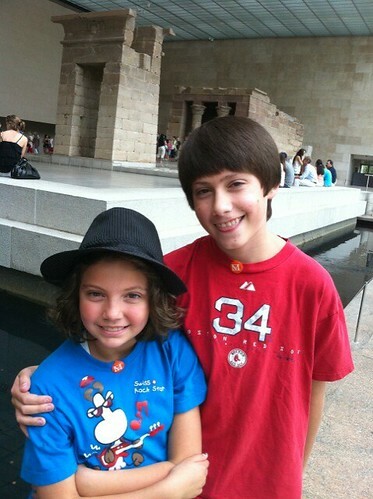 It was fun acting like a tourist in a city I have lived in, and taking the kids to all the popular spots. We stayed on the Eastside in the Beekman Tower Hotel, near the UN building. Not only am I an Eastside person, but it was nice to be in a non-touristy, residential area. We stayed near Times Square before and there was just too much hustle and bustle of tourists. The best way to see the city is to get a City Pass, which gives you access to six attractions, and in many cases lets you bypass the lines. Below are the highlights of our trip. This was the first of several museums we went to, but if you take a very laid back approach to museums, kids will enjoy them. 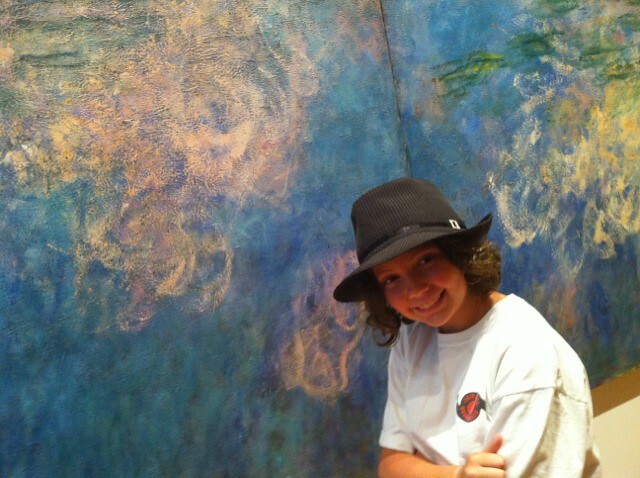 We focused on pieces that the kids were familiar with, like Monet’s Water Lilies (above) and Van Gogh’s Starry Night. These museums are just too big to stop at every work, read the card and go to the next one. Even for adults. I focused on these important pieces and the reality of what you can see by standing in front of them. Things like how much of Starry Night is created by the brushstrokes and the layers of paint. This is never really conveyed in a book. Grace is a big fan of the Percy Jackson series of books, which brings Greek mythology into the modern day. The museum had a great guide highlighting select pieces based on the characters in the book. The first book also begins in the museum itself. Grace enjoyed finding these works with her special guide. We also enjoyed the Knights in Armor (one of my favorites as a kid) and the Egyptian artifacts, including the Temple of Dendur. 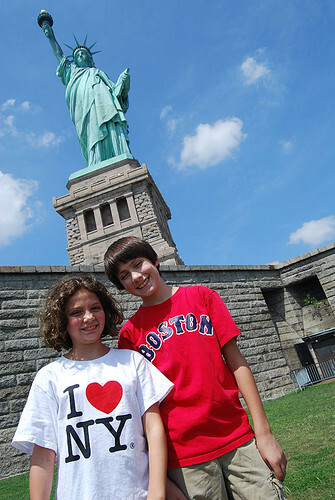 A boat ride in New York Harbor on a hot sunny day led us to the famous statue. We learned a little bit about its history from a Park Ranger and did not go inside, as all tours must be pre-booked and were not included with our passes. After a few pictures, we were back on the boat. 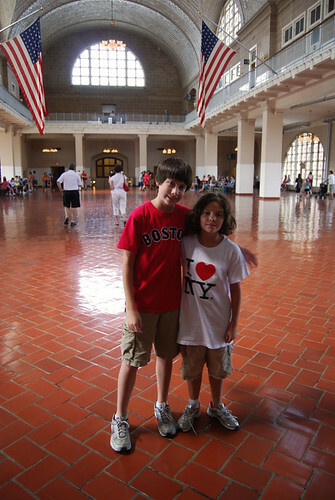 The Immigration Museum on Ellis Island was more interesting to me, than to the kids, but we did talk about all the people who came through Ellis Island. We talked about the strength it must have taken to pack all your belongings and travel across the ocean to a place where you don’t speak the language. While I have family members whose name was changed when they arrived in the US, I don’t know any specific relatives who came through Ellis Island. 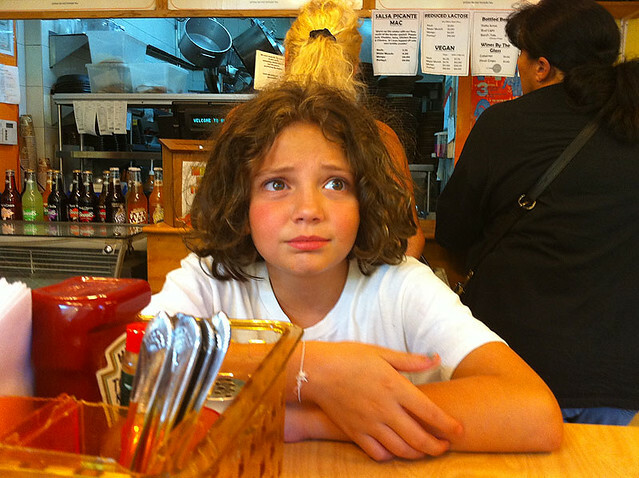 We went to an all Mac N Cheese restaurant called S’mac and Grace reviewed it for her web show. No kid trip to New York is complete without a stop at the Museum of Natural History. We used their iPhone app to find the big Blue Whale and the Dinosaurs. While some things have not changed since I was a kind, the Hayden Planetarium and Space Center are brand new. The planetarium (which is the device that projects the stars, not the curved dome) is long gone and replaced with a digital projection system. 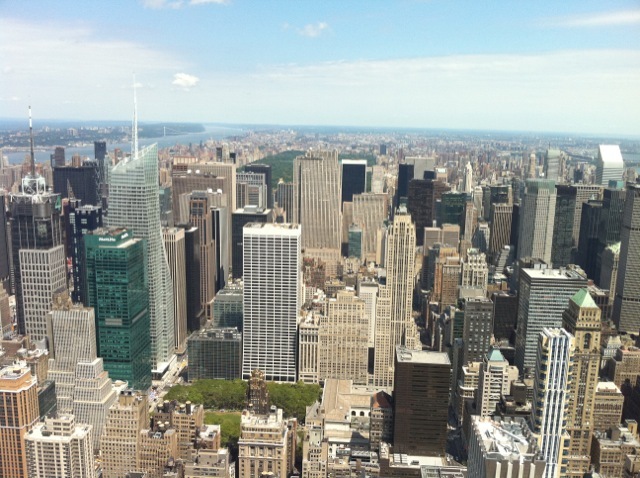 And we ended our trip with a view of the city from the 86th floor observatory at the Empire State Building. We also met my sister for dinner, which was great since the kids haven’t seen her since the last time we were in New York three years ago. Here are more photos from the trip. I recently traveled to New York City to speak at a conference and had a full day to wander around and see the sights. It turned out that I only took photos with my iphone, so they were already online, but I will post a few notable ones here. 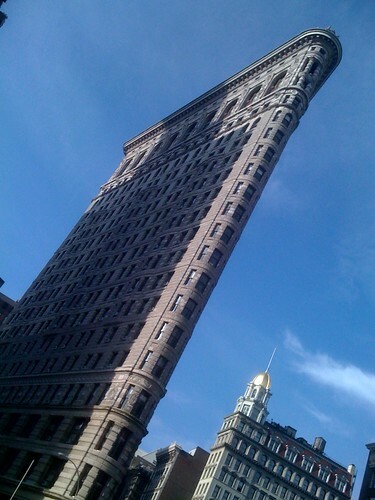 This is one of my favorite buildings in New York, the Flatiron Building. It sits where 23rd Street, 5th Avenue and Broadway comes together, creating a small triangle of real estate. One of the things that has changed in the area is the creation of public spaces where Broadway used to have three lanes of traffic. It now has one and there is a place with tables and umbrellas, planters and large rocks. It is nice spot to sit and rest after a long walk. New York is a walking city and they really seem to understand creating public spaces for sitting. In the shadow of the Flatiron Building is Madison Square Park. Years ago, this was run down, dirty park, largely populated with homeless and drunks. Today it features a large grassy meadow with public sculptures, a playground, a dog park, tables and chairs for sitting (in addition to the ubiquitous park benches), and the best part of all, one of NYC’s trendiest burger place, The Shake Shack. While I did not eat anything at the Shake Shack, I did wait in line for a little while. Even their website acknowledges the line by displaying a live web cam view of it. In addition to lots of walking around, I also dropped by my old agency to say hi. I worked there nearly 20 years ago, but as holiday cards transitioned to LinkedIn, I have remained in touch with my old boss, who is one of the agency principals now. It wasn’t that hard for her and her brother to wrestle control from their dad and uncle as they advanced in years. 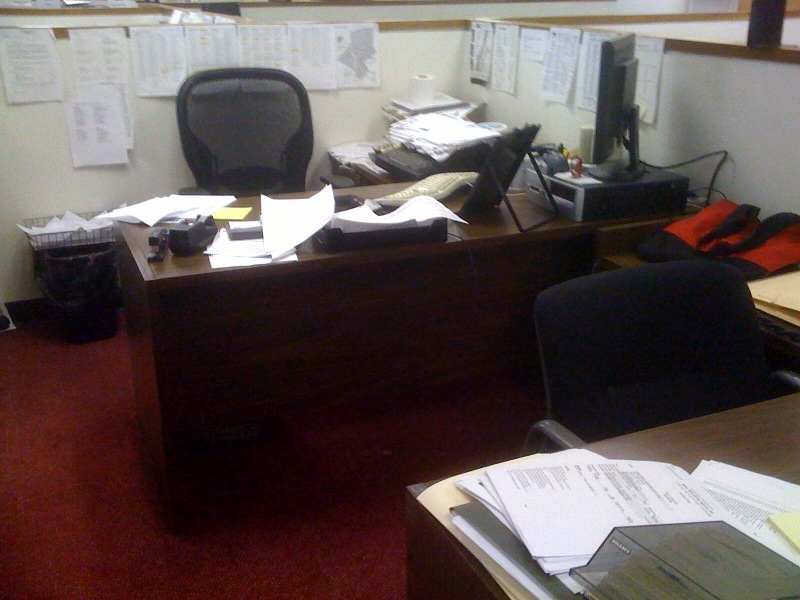 But it was odd to see my old desk. I had to take a picture of it of course. So after my friend, Kipp, arrived, we picked a place for dinner and started walking. One of the advantages of using review sites in NYC is there are lots of reviews. Just pick a type of food (Italian) and a neighborhood (Greenwich Village), and check out the results with the best ratings. We chose a place called Lupa Osteria Romana. It was opened by Mario Batali and crew in 1999, and is modeled after a traditional Roman trattoria, providing classic Roman cuisine in a festive atmosphere. Since we did not go to their website before eating there, I just discover this. I also found they are on Twitter and Facebook, but not very engaged. I had a raw tuna “cooked in vinegar” seviche-style with cannelini beans and red onion. We shared a fettuccine dish with chicken and pork. I had Saltimbocca for my entree. Everything was delicious, but the best dish was the crispy duck “agrodolce” that Kipp had. It had been prepared confite style, and then roasted. It was super tender and very tasty. I also had a glass of the Vermentino Colli di Luni Giacomelli 2006. It was drier than the NC one we reviewed from Raffaldini. Next it was off to Little Italy to find cannoli. That night the Feast of San Genero was going on, but we still managed to find Ferrara’s. 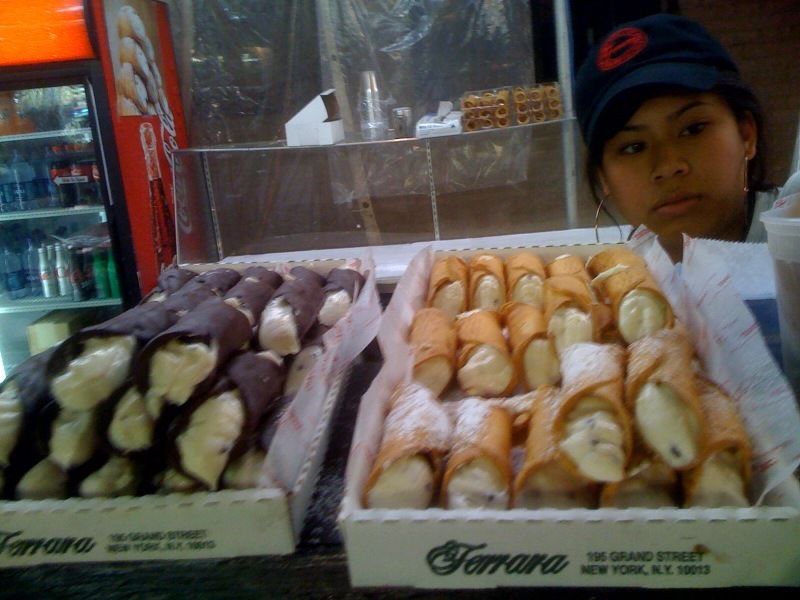 We got regular and chocolate covered cannoli. It was a long walk back to our hotel, but it was a nice night, so it wasn’t too bad. Well, except I was really wiped out from all the walking. The next day was the conference and a flight home. We walked around some, but no notable sites or pictures. Here’s a link to all my photos on Flickr. 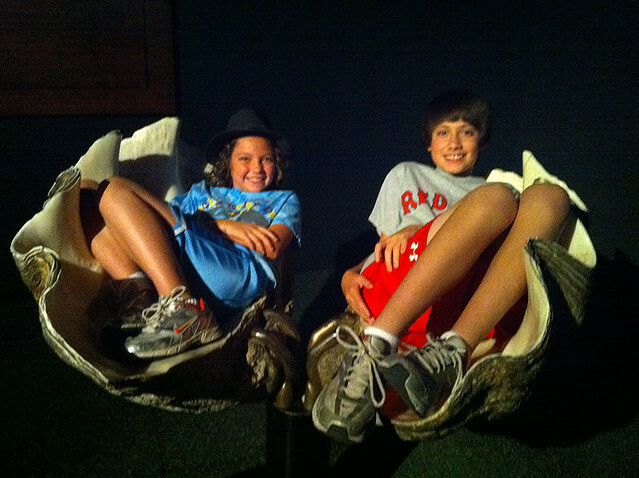 For the kids’ Spring Break this year, we went to Florida and had a jam-packed week. We were busy, but with plenty of time to relax. 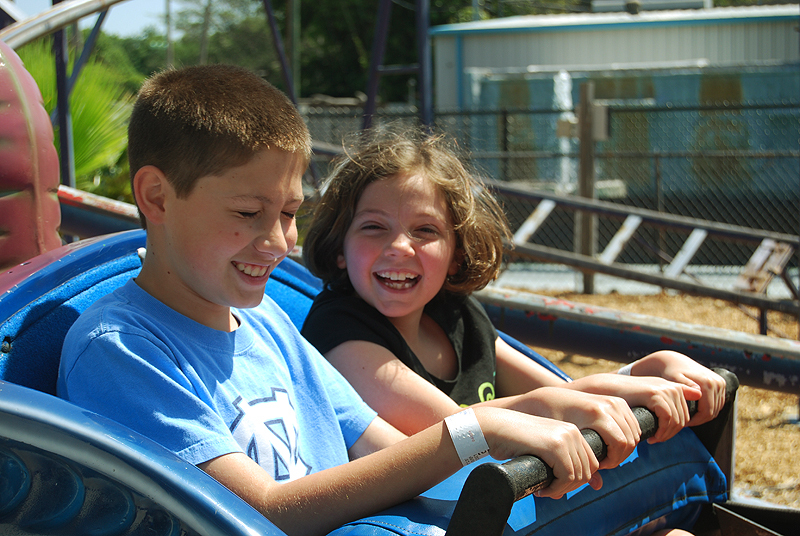 Our schedule included swimming, a kids museum called the Imaginarium, an amusement park, a little bit of shopping, a boat ride to the beach, mini-golf, lots of eating, Passover Seder and the kids’ favorite activity: riding in the golf cart. 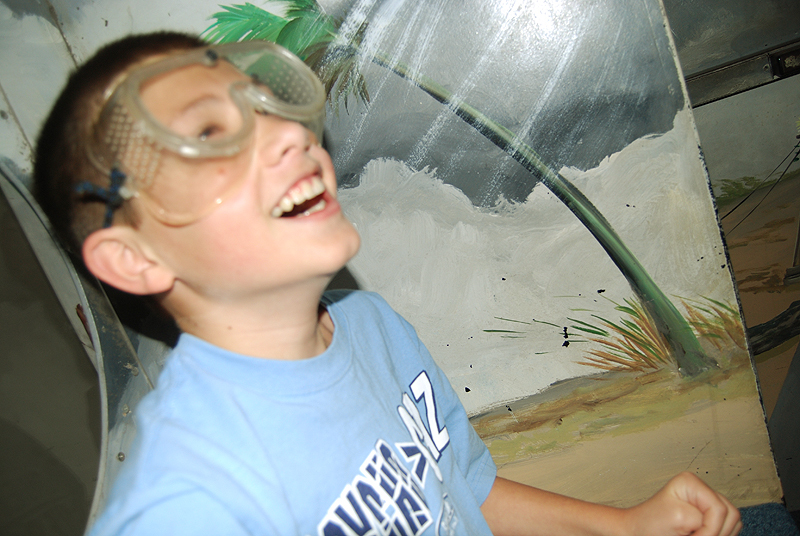 Peter in a hurricane simulator with 45 mph winds, which is really a tropical storm simulator. 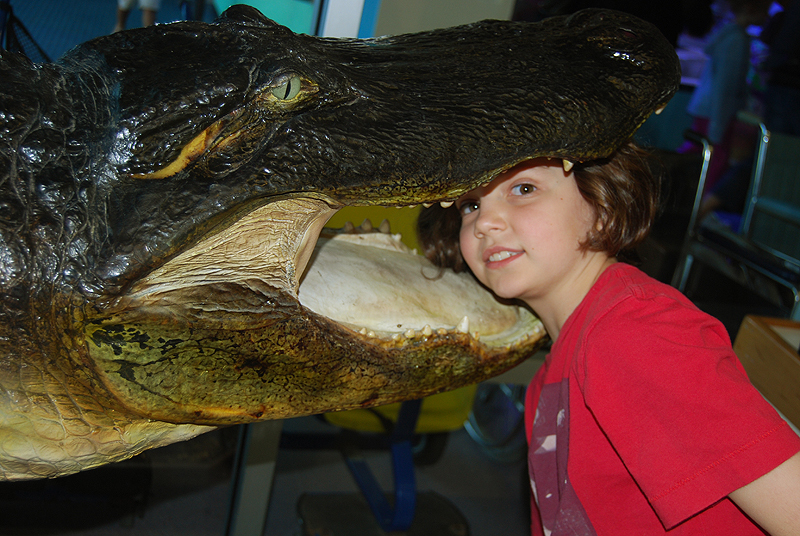 Grace with her head in an alligator’s mouth. She does look a little nervous. Laughing on the Dragon Coaster. The kids rode this 10 times. 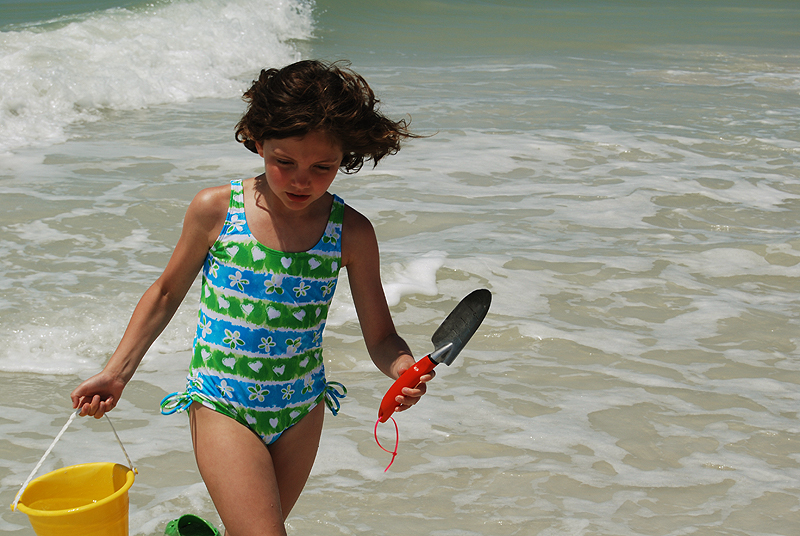 Grace on the beach with a bucket and shovel. Here’s a link to all my photos from the trip. 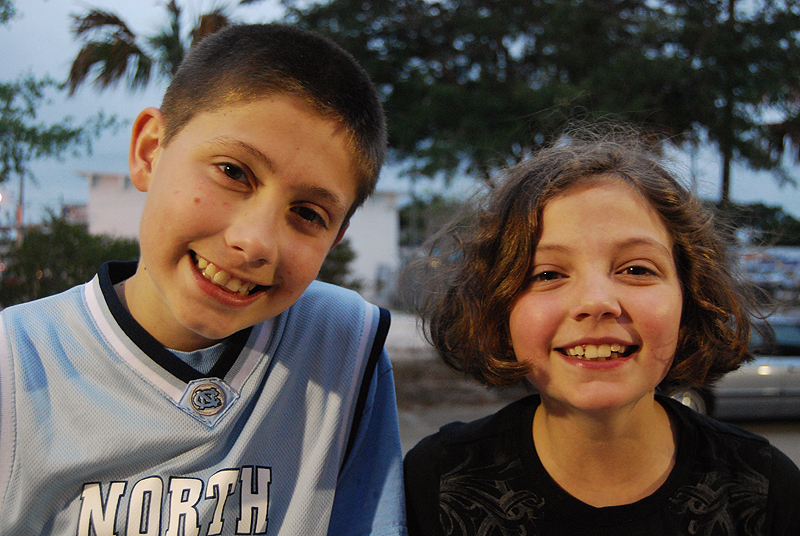 Here are Peter and Grace on our first night in Florida.